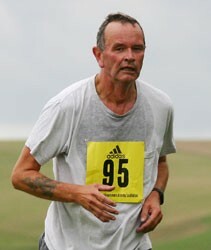 Until the end of this week, I was not looking forward to the Seaford half. I felt unprepared, acutely aware that I was not running the miles an off-road half-marathon requires. This week's three runs, each different, changed my perspective. Run the first: I took the Seaford Striders Couch to 5k group on their fourth outing. It’s extraordinary how they stick at it. I had expected a number to drop out, but we tackled a longer distance, making it to the sea and back, with longer periods of running. Run the second: I had toyed with the idea of taking on the Good Good Friday Run, an eight mile run from Brighton Marina and back, but one of the country’s leading agronomists, charliecat5 (aka Duncan) invited me to an 8 a.m. excursion from Lewes to Ditchling, and promised to explain the Ontario Heat Unit to me as we ran. How could I resist? The morning was bright, and we set out on the track towards Blackcap. I failed to start my Garmin properly, so we were 1.7 miles in before I realised I had no record. As we reached Blackcap, the sun came out and we ran on the path on top of the escapement, with Plumpton and Ditchling below us, and further away Burgess Hill and Haywards Heath. Duncan raced away from me on more than one occasion, but I kept going, and he waited patiently for me to catch up. Run the third: I went out for six miles over Seaford Head and down to the Cuckmere on Easter Sunday. Cold, windy, but larks sang and the sun shone for much of the time. This week’s running consisted of leading the second week of the Seaford Striders Couch to 5k group on Wednesday, where we took advantage of the lighter evening to run down to the golf course, and along, to run on grass. Impressively, nearly everyone who came to the first session returned, There were twenty-five of us in all. On Saturday I went to Eastbourne parkrun, where, by dint of sticking with the pacers, I managed a PB for the course, beating my previous best time by over a minute. It was the first event of the revamped Seaford Striders Grand Prix I’d taken part in, so should be good for some points. Finally, today I ran a seven mile course in brilliant sunshine around Seaford. My knee hurts, but seems to stop hurting after the first mile or so. In other news, it emerged this week that the Brighton half marathon was short by 146 metres, and has been for the past three years. I hope this will not lead to those who sponsored me demanding their money back.